In North-West Europe, during the later half of 1944 and into 1945, the Canadian Army used two types of armoured vehicles that came to be known as a Kangaroo. The Kangaroo was the world’s first fully tracked ‘Armoured Personnel Carrier.’ This ingenious concept was devised by Lieutenant-General G.G. Simonds, the General Officer Commanding, II Canadian Corps, as he searched for a way to reduce the high casualty rate amongst his infantry. His solution also allowed them to move at ‘tank speed,’ along with their supporting tanks, from start line too final objective. ‘Priest’ Kangaroo armoured personnel carriers with troops of the 4th Canadian Infantry Brigade, 2nd Canadian Infantry Division aboard, on the evening of 7 August 1944 prior to the launch of Operation TOTALIZE. Source: 1 CACR Association & Archive. This innovation was the first use of what have since come to be called armoured personnel carriers, in which infantrymen rode into battle mounted in vehicles with the same armoured protection and mobility as the tanks that accompanied them. An example of the M7 ‘Priest’ 105-millimetre self-propelled gun, pictured here as No. 4 gun, “E” Troop, 78th Field Battery, 13th Canadian Field Regiment, Royal Canadian Artillery, 3rd Canadian Infantry Division, in Normandy, July 1944. This particular vehicle (S215830) was itself converted to a ‘Priest’ Kangaroo armoured personnel carrier, and subsequently was one of the initial 50 issued to the 1st Canadian Armoured Personnel Carrier Squadron, on 1 September 1944. Source: MilArt photo archive. The concept of carrying troops into battle in specially adapted tanks had been tried as far back, as the Canadian Corps’ Amiens (France) offensive of August 1918, during the Great War of 1914-1919. Trials had been conducted in the United Kingdom during 1942-1943, in the use of armoured sleds carrying infantry, which were towed by tanks, and which was put into practice by the United States Army at Anzio (Italy) in early 1944. I Canadian Corps, at that time in Italy (1944), had also suggested the use of ‘stripped’ down universal carriers,1 towed by tanks, as armoured infantry carriers, in the attack. 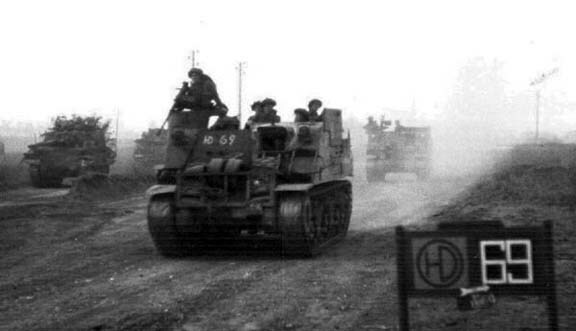 However, Operation TOTALIZE marked the first battlefield appearance, of specialized armoured troop-carrying vehicles of the sort, which had the same armoured protection and mobility as tanks. This permission being obtained, the urgent task of converting these equipments was set in motion. On the evening of 31 July, Brigadier G.M. Grant, Deputy Director of Mechanical Engineering, First Canadian Army,3 was instructed by Crerar, to set up an organization to convert 72 M7 ‘Priest’ 105-millimetre self-propelled guns to armoured personnel carriers by 9 August. This date was soon however changed to 6 August with “as many as possible” by the night of 5 August. At noon on 1 August, Major G.A. Wiggan,4 Officer Commanding, 2nd Tank Troops Workshop, Royal Canadian Electrical and Mechanical Engineers, was called to the Deputy Director of Mechanical Engineering office at First Canadian Army headquarters. Here he was instructed to carry out the task of converting these 72 M7 ‘Priest’ 105-millimetre self-propelled guns into armoured personnel carriers. Major Wiggan was instructed to set up an ad-hoc Advanced Workshop Detachment5 (code named ‘AWD Kangaroo’) to carry out these conversions. 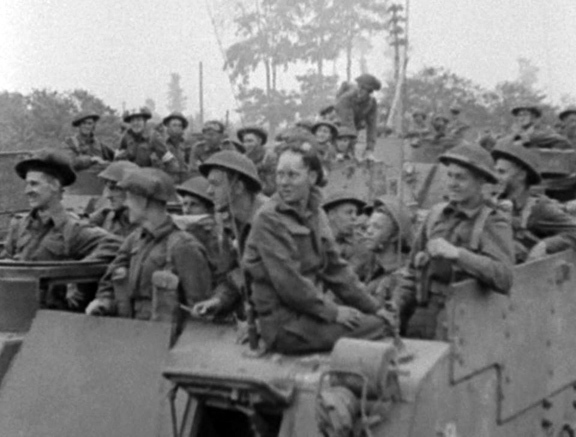 ‘Priest’ Kangaroo armoured personnel carriers, with troops of the 4th Canadian Infantry Brigade, 2nd Canadian Infantry Division aboard, on the evening of 7 August 1944, prior to the launch of Operation TOTALIZE. Note the driver’s vision aperture in the open position, with the driver seated above on the top of the upper front plate. Source: 1 CACR Association & Archive. 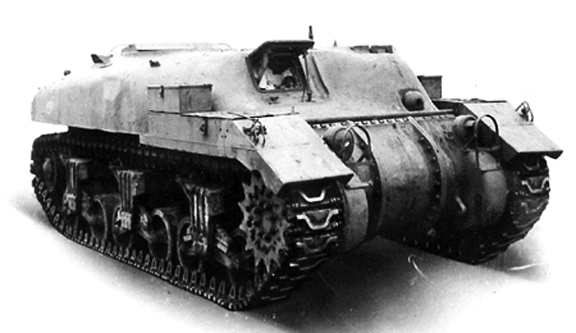 The conversions were to be made in such a way that the Priests could be converted back into self-propelled guns. The process consisted of removing the 105-millimetre gun, with mount and mantlet, and all artillery related equipment, and welding armour plate across the gap left by the removal of the gun. The interior ammunition stowage bins, and crew seating, was also removed, resulting in a spacious interior. The additional armour plating that the previous artillery crews had added along both sides of the fighting compartment, for added protection, was retained. At the same time the radial engine was subjected to an overhaul (the 100-hour check), the M7 ‘Priest’ having a 450-horse power Continental R975 radial aircooled 9-cylinder aircraft engine that required a thorough check after every 100-hours of operation (the overhaul itself would normally take seven days to complete). Finally, the vehicle was given a general serviceability check of the transmission, differential, brake linings and running gear. 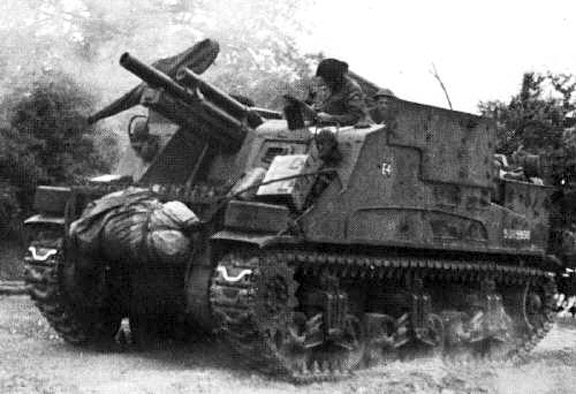 Keep in mind that at the time of conversion, the original M7 ‘Priest’ 105-millimetre self-propelled guns, had been in constant action, from their early June landings in Normandy, up until the decision was taken to convert them into armoured personnel carriers, leaving very little time, for proper maintenance by the artillery crews, due to the urgent need, and demands made on them to provide artillery support, too on going operations. By the time of conversion, these equipments, were in quite rough mechanical shape, and the urgency under which they were converted, left little time, but for the most basic of mechanical repairs, in order to have them serviceable for the forthcoming Operation TOTALIZE. On 2 August, ‘AWD Kangaroo’ was established within the Rear Maintenance Area of 21st Army Group,6 in two fields near Bayeux, France. This was about twenty miles (32-kilometres) from the start line for Operation TOTALIZE. It consisted of elements of fourteen Canadian and British, electrical and mechanical engineering units,7 and consisted of 250 all ranks, 250 all ranks, who pooled their efforts and skills into the project. The first crews arrived late in the afternoon and, by last light, had 14 vehicles stripped.8 The hours of work established were from 5:00 to 11:00 A.M., and 12:30 to 5:00 P.M., and 6:00 to 10:00 P.M. daily, but with the urgency of the situation, 4:00 A.M. to 11:00 P.M., was the norm. All Canadian and British electrical and mechanical engineering units within First Canadian Army were canvassed for electric and gas welding equipment, along with the tradesmen to go with them. Unlimited access to welding rod, armour plate, radial engine parts, oxy-acetylene welding sets and gases and radial engine overhaul stands were required. 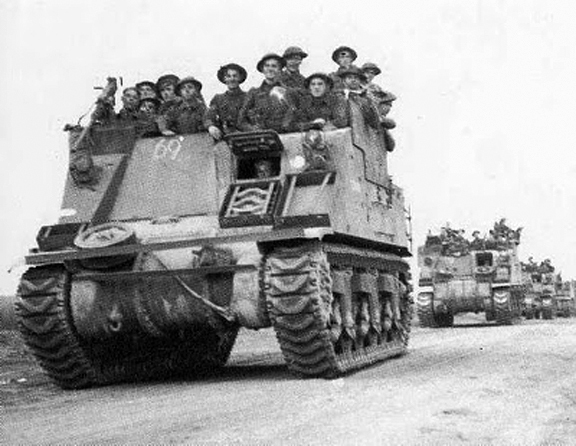 ‘Priest’ Kangaroo armoured personnel carriers, carrying troops of the 4th Canadian Infantry Brigade, with tanks of the 2nd Canadian Armoured Brigade, on the evening of 7 August 1944, moving to their start line prior to the launch of Operation TOTALIZE. Source: 1 CACR Association & Archive. The armour plate came from the ‘Help Yourself Park’ of “W” crocks (the name given to tanks salvaged from the battlefield that were declared beyond repair), and after this source was exhausted, steel plate from the Schneider Steel Works in Caen and from wrecked and stranded Naval craft on the beaches was tried. Both were found to be unsuitable, so mild steel ½-inch plate from the steel mills in the south of Caen was used. These plates were welded over the opening left by the removal of the gun, in the form of spaced armour, that is, one plate welded over the opening from the outside and one welded over the opening from the inside, with the space between the plates being filled with sand. The ‘Priest’ Kangaroo hull, was constructed of rolled and cast homogeneous steel, of welded assembly, and was 19-feet, 9-inches in length, 9-feet, 9¼-inches wide, and stood at a height of 8-feet, 4-inches, with a ground clearance of 17 1/8-inches. The armour of the upper front plate was a ½-inch thick, that of the lower front plate was 2 to 4 ½-inches thick, well the sides and rear plates were also, a ½-inch thick. The interior of the hull was divided into two compartments, the fighting compartment, and the rear compartment (or the engine compartment) which housed the power unit (engine) and transmission gear. The driver’s position, was located in the left-front of the fighting compartment. 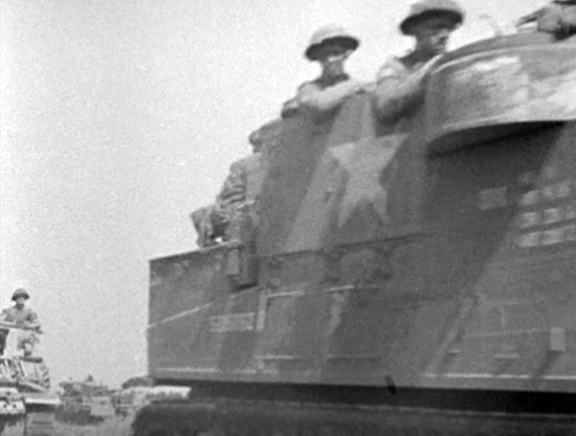 The driver was provided with a large vision aperture, with a small vision port protected by very heavy glass, for use, when the large vision aperture was closed, although most drivers preferred to keep the large vision aperture open in all but the heaviest enemy fire. They felt it was not really safe to drive using the small vision port only, their field of view was too restricted and their vehicle was often used in rather tight quarters. The driver was also provided with a removable windshield which could be fitted into the large vision aperture, when operating the vehicle, with the aperture in the open position. A large box was provided for its stowage, when not in use, which was mounted to the driver’s left, on the inside, of the front armour plate. The driver carried out opening and closing of this aperture, from within the vehicle. A rear view of troops ‘embussed’ (loaded) in a ‘Priest’ Kangaroo. Note the thickness of the upper left-side additional armour plating, and the ‘absence’ of the basic pioneer tools, except for a lone shovel, on the engine compartment top plates. This particular vehicle, saw service as the No. 4 gun, “F” Troop, 43rd Field Battery, 12th Canadian Field Regiment, Royal Canadian Artillery, of the 3rd Canadian Infantry Division, before conversion to that of a ‘Priest’ Kangaroo armoured personnel carrier. Source: 1 CACR Association & Archive. Many of the ‘Priest’ Kangaroos retained their anti-aircraft/ground defence .50-calibre Browning heavy machine gun M2, heavy barrel, which was mounted in a ring mount, on the right-front corner of the fighting compartment, underneath which, on the hull side interior wall, stowage was provided for boxes of .50-calibre belted ammunition. About 60% of the ‘Priest’ Kangaroos retained their No. 19 wireless sets (a radio set) for communications. The No. 19 wireless set consisted of an “A” set for general use, and a “B” set for short range inter-tank work at the troop level, and an intercommunication unit for the crew. Access to the vehicle was gained by four pairs of grip bars, with two pairs being mounted on each side of the fighting compartment, which served as ladders to the fighting compartment. Access to the engine was provided through two engine compartment top plates, and through a set of rear engine doors, located below the rear plate of the upper hull. Located within the engine compartment, were four fuel tanks, with a total fuel capacity of 176 gallons. The ‘Priest’ Kangaroo had a road speed of approximately 25-miles per hour, and a cross-country speed of approximately 15-miles per hour. The suspension used on the ‘Priest’ Kangaroo, was the ‘Vertical Volute Spring’ type, which consisted of 12 wheels in six bogies, with three bogie assemblies per track. The two wheels in each bogie assembly were pivoted on arms against a vertical spring which was protected by the bogie carrying bracket. A return roller was mounted either on top of, or behind, the bracket, the entire bogie assembly forming a self-contained fitting unit. External stowage bins and containers (for various tools,9 and equipment), were also provided for, along with the standard compliment of pioneer tools (shovel, crowbar, pickaxe, axe) and recovery/breakdown equipment (tow cable, jack and wood blocks) which were carried on all tanks. Four towing shackles were provided on the vehicle, two at the front, and two at the rear. A towing pintle was provided at the rear below the rear engine door, with a maximum towing capacity of 10,000 pounds. Upon conversion, the majority of the ‘Priest’ Kangaroo armoured personnel carriers, retained the markings of the artillery regiments, with which they had served as self-propelled guns, as can be seen in this photo. The markings above (‘D1’) and below (‘43’) the right-hand headlamp, indicate that this vehicle saw previous service as No. 1 gun, “D” Troop, 44th Field Battery, 13th Canadian Field Regiment, Royal Canadian Artillery, of the 3rd Canadian Infantry Division. Source: 1 CACR Association & Archive. Directly below the ‘allied recognition star,’ which is painted on the right side of the fighting compartment, can be seen two pairs of grip bars, which were used to gain access to the vehicle, with another two pairs mounted on the left side, in the same position. Source: 1 CACR Association & Archive. By the evening of 5 August, the 72 carriers were ready (with four more ready at noon on 6 August, which were held in II Canadian Corps reserve). Lieutenant-General Simonds, divided these 72 completed ‘Priest’ Kangaroos among the 4th Canadian Infantry Brigade, of the 2nd Canadian Infantry Division, and the British 154th (Highland) Infantry Brigade, of the 51st (Highland) Infantry Division, for Operation TOTALIZE.10 Each ‘Priest’ Kangaroo could carry approximately 10-15 fully armed infantrymen and their equipment, who ‘embussed’ (loaded) and ‘debussed’ (unloaded), over their armoured sides. Drivers for these converted ‘Priest’ Kangaroos, where found from No. 9 Canadian Base Reinforcement Battalion (which held Canadian Armoured Corps, and Royal Canadian Artillery reinforcements) and from the personnel and reinforcements carried by “E” Squadron, 25th Canadian Armoured Delivery Regiment (The Elgin Regiment), Canadian Armoured Corps,11 and from among those artillerymen of the three field regiments of the 3rd Canadian Infantry Divisional Artillery who had operated them (who were now surplus to their respective field regiments, as they had converted to towed guns), each ‘Priest’ Kangaroo ending up with a crew of one man, the driver. To maintain the 36 ‘Priest’ Kangaroos allocated to 2nd Canadian Infantry Division, an ad-hoc ‘Kangaroo’ Light Aid Detachment,12 of 31 all ranks (drawn from numbers 32, 33 and 34 Light Aid Detachments,13 Royal Canadian Electrical and Mechanical Engineers) under Captain W.T.E. Duncan (formerly of No. 33 Light Aid Detachment, Royal Canadian Electrical and Mechanical Engineers ), was established to service 36 ‘Priest’ Kangaroos, for a supposed period of ten days to two weeks. At 11:30 P.M. on 7 August 1944, for the first time in Canadian history, armour and infantry advanced to the attack with the infantry protected from the enemy small arms fire and shell splinters. At the same time they were able to keep up with their tank support, as all were moving forward on ‘tracks,’ at tank speed. This use of the ‘Priest’ Kangaroo armoured personnel carriers was an immediate success. The infantry was able to obtain their objectives without suffering heavy losses from the enemy’s defensive machine gun and mortar/shell fire, while traversing the ground from start line too objective. The advance confirmed the effectiveness of this new tactical weapon. The mobility provided to the infantry by the ‘Priest’ Kangaroo armoured personnel carriers, along with the armoured protection, resulted in fewer casualties and greatly increased morale. The ‘Priest’ Kangaroos also proved effective in the role of delivering supplies forward to the infantry, and in the evacuation of casualties to the rear. One of the 36 ‘Priest’ Kangaroo armoured personnel carriers, allocated to the British, 51st (Highland) Infantry Division, for Operation TOTALIZE, carrying troops of the 7th Battalion, Argyll and Sutherland Highlanders, 154th (Highland) Infantry Brigade. Note the ‘HD 69,’ chalked onto the outside armoured plate welded over the opening left by the removal of the gun, which was used as a means of identifying what unit a ‘Kangaroo’ was carrying, for movement control purposes. The number ‘69,’ being the Arm-of-Service serial used by the 7th Argyll’s, within 51st (Highland) Infantry Division. Also of note, the sign in the lower right-hand corner of the photo, was used to indicate the location of the 7th Argyll’s battalion headquarters, when in a static location. Source: authors’ collection. Their success in Operation TOTALIZE (notably, in the lowering of infantry casualties) was immediately followed up by their use during the continued drive on Falaise known as Operation TRACTABLE (14-16 August).14 It was quickly realized (as early as 20 August) however, that a stronger parent organization for these one-maned crewed carriers, and the ‘Kangaroo’ Light Aid Detachment, was needed, and so, on 28 August 1944, instructions were issued for the organization, on a temporary increment basis only, of 1st Canadian Armoured Personnel Carrier Squadron, Canadian Armoured Corps, and Light Aid Detachment 1st Canadian Armoured Personnel Carrier Squadron, Royal Canadian Electrical and Mechanical Engineers, under the direction of Headquarters First Canadian Army in First Canadian Army Troops Area. The temporary basis of the Squadron and Light Aid Detachment, was to be reviewed monthly. Captain F.S. Corbeau, formerly of The Grey and Simcoe Foresters,15 was appointed Officer Commanding, 1st Canadian Armoured Personnel Carrier Squadron, and Captain W.T.E. Duncan16 (formerly the officer commanding the ad-hoc ‘Kangaroo’ Light Aid Detachment) was appointed Officer Commanding, the Light Aid Detachment 1st Canadian Armoured Personnel Carrier Squadron, Royal Canadian Electrical and Mechanical Engineers17 (with effect from 1 September). The squadron, and attached Light Aid Detachment, was formed as an increment to Regimental Headquarters, 25th Armoured Delivery Regiment (The Elgin Regiment), for the purposes of administration. Under the ‘Table of Organization’ issued on 24 August, the Squadron was to have four troops of 25 ‘Priest’ Kangaroos each, for a total of 100, and an overall personnel strength for the squadron of 131 all ranks. Again, the personnel were drawn from No. 9 Canadian Base Reinforcement Battalion,18 and from those qualified, of the 12th, 13th and 14th Field Regiments, Royal Canadian Artillery, of the 3rd Canadian Infantry Division. A column of ‘Priest’ Kangaroos, carrying troops of the 7th Battalion, Argyll and Sutherland Highlanders, 154th (Highland) Infantry Brigade (although the chalked ‘HD’ is barely visible beside the number ‘69’), moving toward their ‘forming up point’ for the start of Operation TOTALIZE. Source: authors’ collection. On 1 September, Captain Corbeau’s squadron, took over 50 ‘Priest’ Kangaroos19 (half of his authorized establishment), from “E” Squadron, 25th Armoured Delivery Regiment (The Elgin Regiment), from which, on 2 September, he divided the Squadron into four Troops, consisting of, No. 1 Troop – with 14 ‘Priest’ Kangaroos, No. 2 Troop – with 12 ‘Priest’ Kangaroos, No. 3 Troop – with 12 ‘Priest’ Kangaroos, and No. 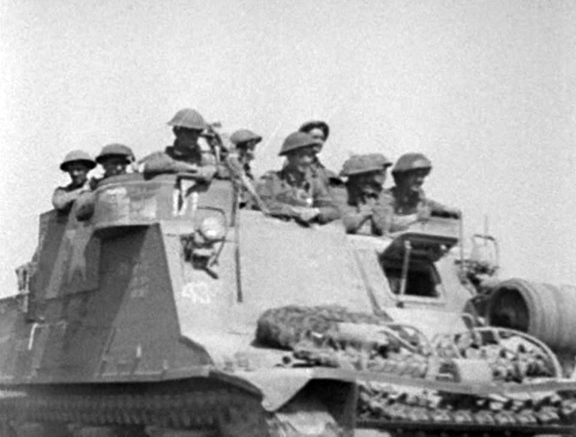 4 Troop – with 12 ‘Priest’ Kangaroos, for which he only had 28 gunners (the designation used by the Royal Canadian Artillery, for a ‘Private), Royal Canadian Artillery, who were qualified ‘Driver Tank’, of which only 14 had any driving experience. With the help of borrowed personnel from “F” Squadron, 25th Armoured Delivery Regiment (The Elgin Regiment),20 on the night of 2/3 September, the Squadron moved, on it’s ‘tracks’, to a harbour area near Brionne, France, where they were to await instructions for a probable move back to Bayeux (France), to return to Ordnance their ‘Priest’ Kangaroos and be re-equipped with ‘Ram’ Kangaroo armoured personnel carriers. Once in harbour (Brionne), and while awaiting the order to proceed to Bayeux, to exchange their ‘Priest’ Kangaroos for the new ‘Ram’ Kangaroos, Captain Corbeau’s squadron, spent 3 to 7 September doing much needed maintenance. 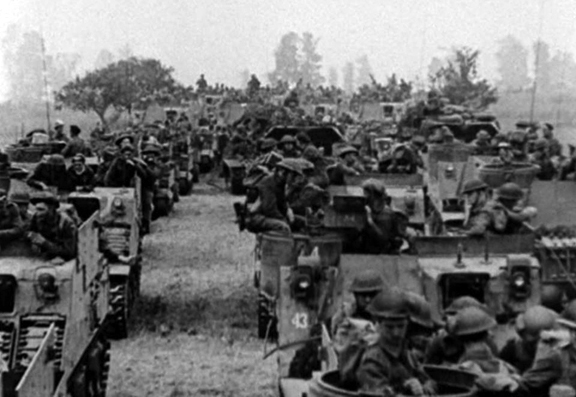 Since the night of 7/8 August, the ‘Priest’ Kangaroos had been in continuous use, supporting First Canadian Army operations in the drive toward Falaise and the closing of the ‘Falaise Gap’, there had been little time for proper maintenance to be carried out on them. However, late on the afternoon of 7 September, the Squadron received orders to move to Bolleville, France, and report to I British Corps, where Captain Corbeau learned that the Squadron would be taking part in the operation to capture Le Havre (Operation ASTONIA), in which operation they were to be involved with from 8 to 12 September, with the British 49th (West Riding) Infantry Division, and 51st (Highland) Infantry Division. Two of the 36 ‘Priest’ Kangaroos, allocated to the British, 51st (Highland) Infantry Division (both of which appear to be empty), travelling ‘down’ the SINATRA route. This route had been cleared from the 154th (Highland) Infantry Brigade’s rear assembly area, forward to the brigade’s start line, by the British 274th Field Company, Royal Engineers, of the 51st (Highland) Infantry Division, prior to the launch of Operation TOTALIZE. 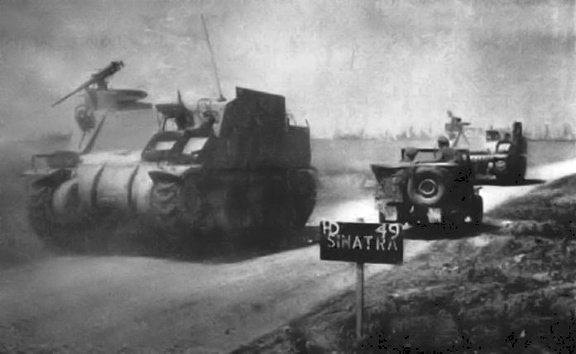 Note the use of the Highland Division’s ‘HD’ and the number ‘49,’ which was the Arm-of-Service serial used by the 274th Field Company, on the route marker (SINATRA), in the lower right-hand corner of the photo. Source: MilArt photo archive. On 13 September, the Squadron was ordered to concentrate at Bolbec, France, where tank transporters were to pick-up and move the ‘Priest’ Kangaroos to a harbour area near La Capelle (France). Upon arrival they came under command of 3rd Canadian Infantry Division for the capture of Boulogne (Operation WELLHIT). During this operation, the Squadron was split between the Stormont, Dundas and Glengarry Highlanders, and the North Nova Scotia Highlanders, of the 9th Canadian Infantry Brigade, with 20 ‘Priest’ Kangaroos allotted to each, during various phases of the battle, from 17 to 22 September. 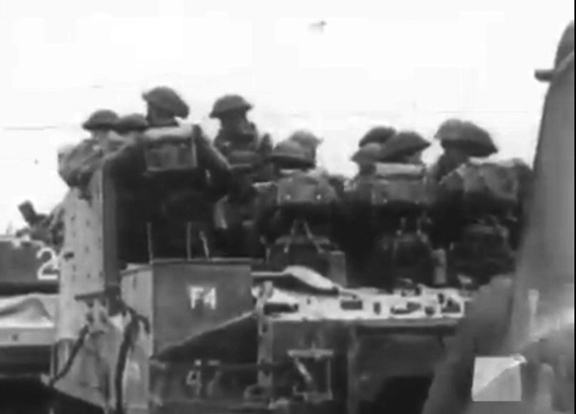 On 23 September, the Squadron received orders that they were to be included in the capture of Calais (Operation UNDERGO), again, under command of 3rd Canadian Infantry Division, this time carrying the 1st Battalion, Canadian Scottish Regiment, throughout operations on 24 and 25 September. On 30 September, orders were received from Headquarters, First Canadian Army, that all ‘Priest’ Kangaroos, were to be turned into a British Royal Electrical and Mechanical Engineers Workshop, in the Cassel (France) area. The Squadron’s ‘Priest’ Kangaroos were to travel to Cassel on their own ‘tracks’ where, once turned in, the drivers would proceed to Pierreval (near Rouen, France) where they were to pick-up new ‘Ram’ Kangaroo armoured personnel carriers from “F” Squadron, 25th Armoured Delivery Regiment (The Elgin Regiment). The issue of these ‘Ram’ Kangaroos was spread over 1-2 October. Once complete, on 2 October, the Squadron was ordered to concentrate at Mill, The Netherlands. Two troops made their way on their own ‘tracks’, while the other two troops traveled by tank transporter. Once at Mill, the Squadron came under command of VIII British Corps. Within two weeks of 1st Canadian Armoured Personnel Carrier Squadron, having concentrated at Mill, The Netherlands, they were absorbed into the newly embodied 1st Canadian Armoured Personnel Carrier Regiment, Canadian Armoured Corps, while a British sister regiment, the 49th Armoured Personnel Carrier Regiment, Royal Armoured Corps, was also formed shortly afterwards. Each regiment was equipped with 106 ‘Ram’ Kangaroo Armoured Personnel Carriers, giving each regiment the capability of lifting an entire infantry battalion. A future article will deal with the ‘Ram’ Kangaroo Armoured Personnel Carrier, in Canadian Service, 3 October 1944 to 20 June 1945. An example of a ‘Ram’ Kangaroo armoured personnel carrier, with which 1st Canadian Armoured Personnel Carrier Squadron, Canadian Armoured Corps, was issued over the period of 1-2 October 1944. Source: authors’ collection. As a closing note, on 29 August 1944, approximately ten ‘Priest’ Kangaroos, were issued to the 4th Canadian Armoured Division, from their supporting ‘armoured delivery squadron’ (“D” Squadron, 25th Canadian Armoured Delivery Regiment (The Elgin Regiment)). These ten ‘Priest’ Kangaroos, were used as ammunition/supply/troop carriers, within the division, with at least one (based on photographic evidence) being converted into an ‘armoured command post,’ by Headquarters, 4th Canadian Armoured Brigade. Unfortunately, the details of the fate of these ten ‘Priest’ Kangaroos, is rather sketchy, since they were all surplus to the vehicle entitlements, of the units in which they served, and were not ‘officially’ counted against a unit’s vehicle holdings. The author wishes to thank Miss Courtney Carrier, for proofing reading and offering constructive criticism, and comments, on my draft copies of this article, and Bill Miller, for his constructive criticism, and comments, and Clive M. Law, for providing photos from the MilArt photo archives, and for publishing this article, and lastly, my wife, Denise, for her never-ending support. Any errors and/or omissions, are entirely the fault of the author. The Universal Carrier (commonly known as the Bren Gun Carrier), was a lightly armoured tracked vehicle, which served in many different roles. It had no overhead protection, and its armour plate only afforded protection against shell splinters and small-arms fire. The Ordnance, Quick Firing 25-pounder (or just 25-pounder), was the standard field gun, with which the three field regiments of a Canadian infantry division, and one, of the two field regiments of a Canadian armoured division, was equipped with. The officer responsible for the maintenance and repair of First Canadian Army’s equipment. Major Wiggan was subsequently awarded a Member, Order of the British Empire (MBE) for his command of the ‘AWD Kangaroo,’ with part of the citation, for which, reading “His enthusiasm, initiative and driving force contributed very materially to completing in three and one-half days what appeared to be an impossible task in the time available” (awarded as per Canada Gazette dated 17 March 1945, and Canadian Army Routine Order 5466 dated 19 March 1945). An advanced workshop detachment, was a portion of a workshop, which occupied a position forward of its parent workshop’s main location, when the necessity of the situation required it. The Rear Maintenance Area of 21st Army Group, at this time was located around the French city of Bayeux, in Normandy, and contained all the static administrative and maintenance units, supporting the Second British Army, and the First Canadian Army, which were the two armies that made-up the 21st Army Group. From the Canadian, Corps of Royal Canadian Electrical and Mechanical Engineers, and from the British, Corps of Royal Electrical and Mechanical Engineers. The first priority on 3 August 1944, was the completion of a ‘pilot’ model, for approval of its design, which reached Headquarters II Canadian Corps at 6:30 P.M., that evening, for Lieutenant-General Simonds’ inspection. Although, in the initial rush of the ‘conversion’ production, many of the deficiencies in the servicing tools of the original M7 ‘Priest’ 105-millimetre self-propelled gun equipments, were never corrected. The delivery and issue of which was carried out by “D” Squadron, 25th Canadian Armoured Delivery Regiment (The Elgin Regiment), the ‘armoured delivery squadron’ of the 4th Canadian Armoured Division. “E” Squadron, 25th Canadian Armoured Delivery Regiment (The Elgin Regiment), was employed as the ‘Corps armoured delivery squadron’ of 2nd Canadian Corps Troops, and held reinforcement tanks and men to supply the needs of the armoured units which came under command and/or control, of Headquarters 2nd Canadian Corps. A Light Aid Detachment, was made up of members of the Corps of Royal Canadian Electrical and Mechanical Engineers, and was attached to a unit, to assist the personnel of the parent unit in first line repair of its equipment, in so far as that repair was outside the capacity of the unit, to inspect unit equipment and supervise and advise on unit maintenance, to assist the unit in recovering its equipment when damaged or stranded, to assist liaison between the unit and second line workshops, and to advise the unit on technical matters. Numbers 32, 33 and 34 Light Aid Detachments, had been respectively attached to the 12th, 13th, and 14th Field Regiments, Royal Canadian Artillery, while they were equipped with the M7 ‘Priest’ 105-millimetre self-propelled gun. At the end of Operation TRACTABLE, of the 76 ‘Priest’ Kangaroos originally provided, 61 were still ‘battle worthy,’ while the remaining 15 were ‘recoverable vehicle casualties,’ mostly caused by mechanical breakdown. Formally, the 26th Army Tank Regiment (Grey and Simcoe Foresters), Canadian Armoured Corps, which had been disbanded on 1 November 1943, with all of its personnel being absorbed into Canadian Armoured Corps reinforcement units in the United Kingdom, as future reinforcements for Canadian Armoured Corps units, in the field. Captain Duncan was subsequently awarded a Member, Order of the British Empire (MBE), for his untiring efforts, outstanding initiative, resourcefulness, perseverance, and technical ability, under extremely adverse administrative and operational conditions, in maintaining a high standard of ‘battle worthiness,’ of the ‘Priest Kangaroos, in operations from Falaise to Calais (awarded as per Canada Gazette dated 17 March 1945, and Canadian Army Routine Order 5466 dated 19 March 1945). With an approximate overall personnel strength for the light aid detachment of 60 all ranks. Was a component reinforcement battalion of No. 2 Canadian Base Reinforcement Group, which was capable of holding approximately 1,500 reinforcements (of all arms and services). These ‘Priest’ Kangaroos had, by now, been stripped of radios, servicing tools, and pioneer tools, since initially first going into action on the evening of 7 August 1944, and for which, there was a dire shortage of spares parts. “F” Squadron, 25th Canadian Armoured Delivery Regiment (The Elgin Regiment), was employed as the ‘Army armoured delivery squadron’ of First Canadian Army Troops, and held reinforcement tanks and men to supply the needs of the armoured units which came under command and/or control, of Headquarters First Canadian Army Troops. Another excellent article in the series you are slowly building up…Out of interest, is there any record of the original Priest-Kangaroo vehicle census numbers (S series) ?